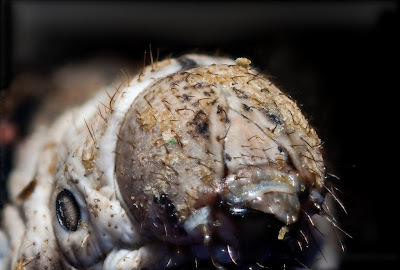 What does this face have to do with sericulture? Everything. Sericulture is the art/industry of raising silkworms for the purpose of harvesting their silk. Bombyx mori is the most common of the silkworm species. It is totally dependent of humans for reproduction and no longer occurs naturally in the wild. So the next time you put on your silk jammies or boxers, think of this face. That's what you get for being so fancy. Thanks for posting this! I meant to give you a heads up on this monster but I forgot. By the way, I suspect that little green spot on his face may be mold, which is like acne except you die.